The acronym "WINFLY" is a military term meaning, of course, winter fly-in. It was first used to describe two scheduled winter flights in June and August of 1967. However, following that year any further scheduled WINFLY flights seem to have been discontinued until 1974 when the August WINFLY flights, as we know them today, were established and made an annual event. These flights traditionally begin on the first or second day the sun rises near the end of the austral winter. The first "annual" WINFLY evolution, in 1974, consisted of three LC- 130 skier flights transporting a total of 62 passengers and 12,568 pounds of cargo into a prior Williams Field location. These ski- equipped flights were the standard procedure for WINFLY. Over the years the number of flights was increased to meet the demanding science and construction schedules. In recent years there were 8-10 flights a year. This year the WINFLY evolution will consist of five C- 141 wheeled flights bringing in 219 passengers and 105, 000 pounds of cargo. Using wheeled C-141 aircraft has enabled a bigger payload that results in fewer flights with less manpower and consequently a shorter and cheaper overall evolution. About $600,000 was saved on the first wheeled WINFLY evolution. The reason we can now use wheeled aircraft is Pegasus. In 1989 it was decided to search for a suitable site to construct a blue ice runway that conventional wheeled aircraft could take-off and land from to help boost cargo weight capacity. The search was conducted using Landsat images and aerial photography. A suitable site was located between a zone of regular yearly snow accumulation and a zone of relatively clean ice. There was just the right amount of snow accumulation to use as a cover to protect a runway from melting and ablating during the warmer summer months yet not too much snow accumulation to make this site hard to maintain. It is located on a section of the ice shelf that is approximately 150 feet thick and is floating on about 1700 feet of water. This ice differs from the surrounding ice shelf in that it is actually vitreous or glass-like as opposed to the more snow-packed texture as is the case at Williams Field. It is believed that this denser texture is the result of a combination of warmer underwater currents and the horizontal compression of the glacial outflow in that locale, but has yet to be fully explained. The site is situated some 18 miles from McMurdo travelling on snow roads, but only about 8.3 miles as the crow flies. It became known as Pegasus and got its name from a Lockheed C-121 Super Constellation that was affectionately named after the mythical flying horse. This particular aircraft had a very hard landing at Willy Field with 68 passengers and 12 crewmembers aboard in October of 1971. There were no serious injuries, but the aircraft sustained major airframe damage and was towed and abandoned where it rests today, just east of Pegasus Runway. Construction began on the runway in 1990 and it took 3 years to build the 10,000-foot long, 300-foot wide runway. Considerable effort was made to laser-plane down the high spots and fill the low spots with water that was melted using the dual-purpose "Blue Lagoon" snow-melter/hot-tub. In February of 1993 the first wheeled aircraft successfully landed at Pegasus. It was a C-130 Hercules. 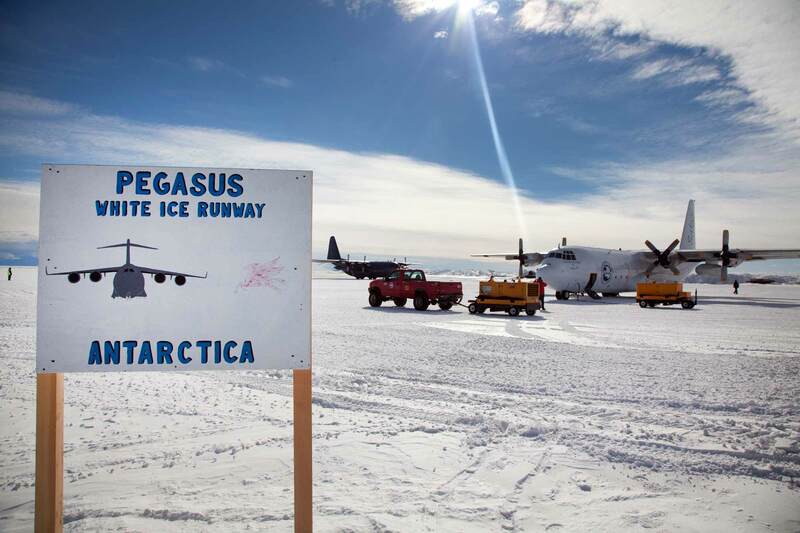 The runway was traditionally used only in January and February to boost efforts in getting supplies to the Pole and help with the major redeployment of personnel going north at the end of the austral summer. After the station closed, the runway was allowed to naturally drift in and was ignored again until the following year's summer usage. Depending on winter storms anywhere from 57,000 - 250,000 cubic yards of snow are removed to make Pegasus operational. In March of 1996 a member of the winter community developed a serious medical condition and medevac plans were initiated. It was decided to use Pegasus since a C-141 is assigned for search and rescue in the Pacific Theater and was more readily available than any of the LC- 130's. The runway was completely ready to accept a flight in just a few days. As it turned out the person passed a kidney stone about 12 hours before the flight was due to land and the flight was cancelled along with our mail, freshies and the hairdressers husband who was going to replace the ill worker. Needless to say we were bummed in one respect, but very relieved that our coworker was healthy again. 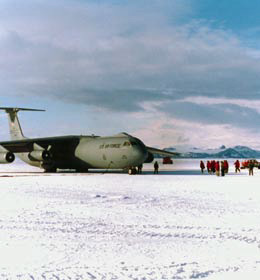 The relative ease and quickness that the runway became operational spurned the thought of using it for C-141 flights during the upcoming WINFLY of 1996. NSF approved the idea and another chapter in Antarctic history was made. This will be the third consecutive year we will use this runway and the C-141 Starlifter for WINFLY. The original runway layout, 10,000 feet long x 300 feet wide. Although its location and width have been adjusted over the years, its orientation has remained 15/33. This drawing is from Construction, Maintenance, and Operation of a Glacial Runway, McMurdo Station, Antarctica, CRREL Monograph 98-1, by George Blaisdell et al. 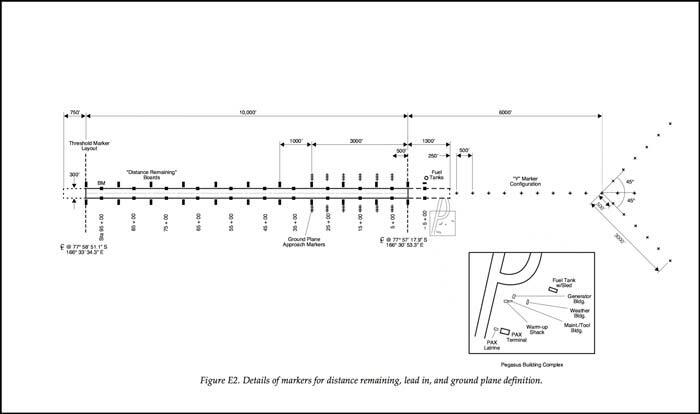 This document (which is available here) (5.1 mb) details and depicts the design, development, construction, and early history of the Pegasus runway.